Let's take a look at the best deals on wireless headphones, speakers, soundbars and more. Amazon's Great India Festival sale is now on its Day 1 and the sale is open for both Prime and non-Prime members. There are attractive discounts on all sorts of products including smartphones, appliances, TVs and more. You can follow our coverage to get the best deals. 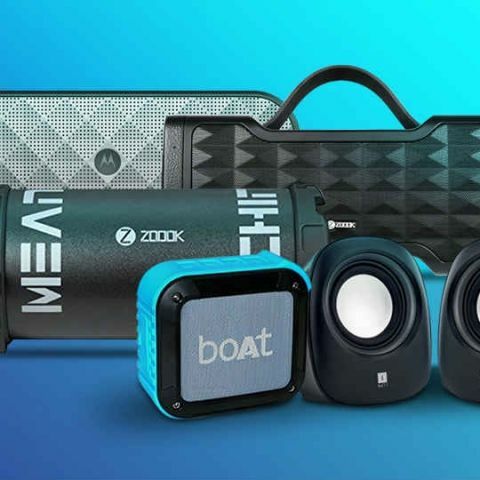 This list is about deals on wireless headphones, IEMs, speakers, soundbars and home entertainment systems. Get the best deals on Sony MDR-ZX110A On-Ear Stereo Headphones (White), without mic here. The Sony MDR-ZX110A looks good and sounds immersive with more emphasis on the bass. It’s one of the best headphones to buy under Rs 1,000. Get the best deals on Philips BT50B Portable Wireless Bluetooth Speaker, Black here. Get the best deals on Sennheiser HD 206 507364 Headphones (Silver) here. These supra-aural headphones sounds quite good for the price they are offered, with crisp bass and a good build quality. Get the best deals on Sennheiser CX 275 S In -Ear Universal Mobile Headphone With Mic (Black) here. The CX 275S offers good distortion, free audio with deep lows and boosted bass response. The headphone also offers an inline remote and can be used for taking calls as well as listening to music. Get the best deals on JBL Cinema SB350 Premium Wireless Soundbar with Wireless Subwoofer here. The wireless soundbar comes with a wireless subwoofer with 2.1 surround sound and dual stereo. It has a powerful output of 350W and offers good connectivity options. Get the best deals on JBL 2.0 Wireless Sound bar with Built in Dual Base Port (Black) here. This all in one soundbar comes with dual bass-port design and offers surround sound. It has an HDMI out and supports streaming from smartphones. Get the best deals on Sony HT-RT3 Sound Bar Home Theatre System (Black) here. The SoundSport Free headphones are truly wireless and house new antennae for connecting with each other and a smart device. It weighs around 10g and come with a magnetic charging case, which not only holds them in place, but doubles as storage case.